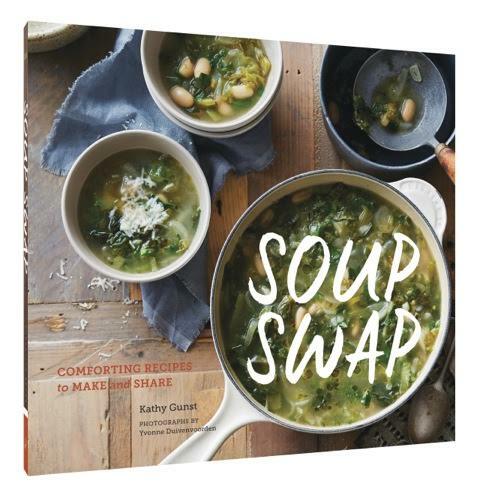 I decided to share a second recipe from Kathy Gunst's new cookbook, Soup Swap, which we are celebrating with the authors of The Book Club Cook Book and a #SoupSwapParty. 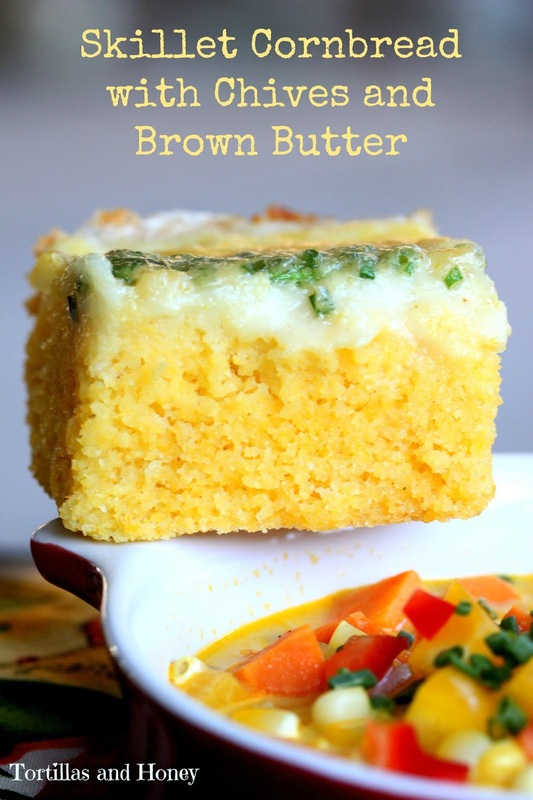 I made this Skillet Cornbread with Chives and Brown Butter to go with her Corn and Sweet Potato Chowder with Saffron Cream and instantly fell in love with this recipe! Look at those photos... What is that? Butter? Frosting? No, that is custard. And cornbread. A custard cornbread! That is what sold me on making this dish. The custard layer is created by pouring milk on top after the cornbread has been baking for a bit. As it continues to bake, a custard layer is formed and it takes on some of the sweetness from the sugar. This extra touch is so unique, I immediately went out and bought all of the ingredients for it, even though I already finished my shopping to make the soup. I actually don't have a cast iron skillet so I improvised and used a baking dish instead, which still came out lovely. I added in my notes how to make this without a cast iron skillet in the recipe below. I also suggest using the full 1/2 cup of sugar instead of the 1/4 because I felt that the custard layer was a little better with the extra sweetness. I've also found that, after making this recipe several times, that the chives can be optional. 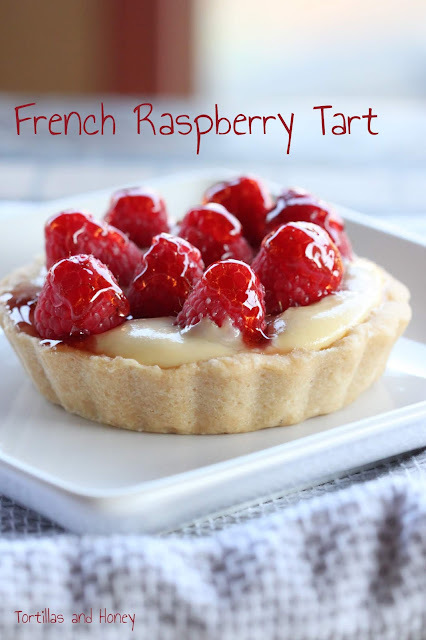 I substituted the all-purpose gluten-free flour as well and it works like a charm! 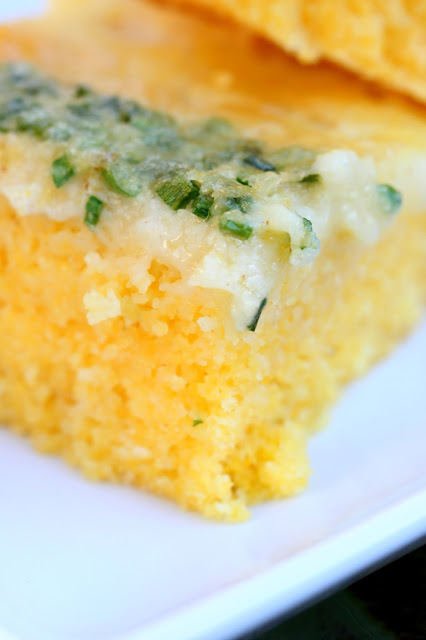 This recipe is one that I'll be making again and again and most likely will become my staple cornbread recipe. Make it! Now!! Position rack in the middle of the oven and preheat to 350. In a large bowl, whisk the cornmeal, sugar, flour, salt, and baking soda until well blended. Add the buttermilk and eggs and whisk to combine. Whisk in 1 cup of the whole milk. Add 2 Tbs of the chive-brown butter, leaving the remainder in the skillet (or in the saucepan), and whisk until combined. (If you browned your butter in a saucepan, pour the remaining butter on the bottom of your 7x11 baking pan, swirling to make sure the entire bottom of the pan is greased.) 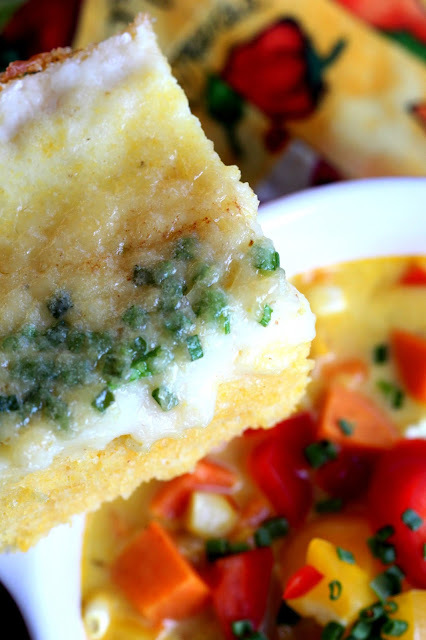 Pour the batter into the skillet and bake for 15 minutes. After 15 minutes, pour the remaining 1 cup of milk on top of the break and bake for another 25 to 35 minutes, or until the cornbread is golden brown and firm. 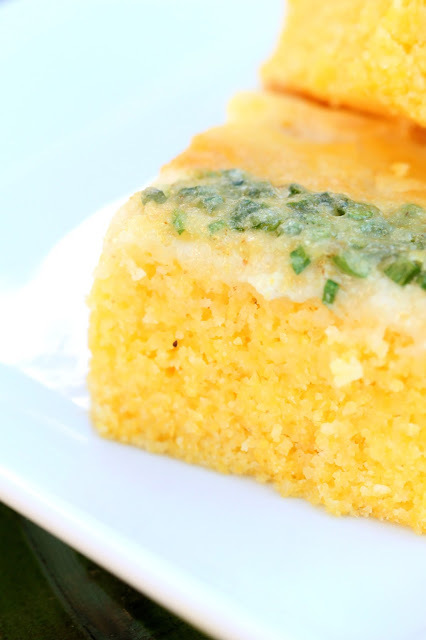 When you gently shake the skillet, the cornbread shouldn’t wobble but it doesn’t need to be bone dry when tested with a toothpick in the center. Remove and let cool slightly. Serve warm, with butter and honey if desired. 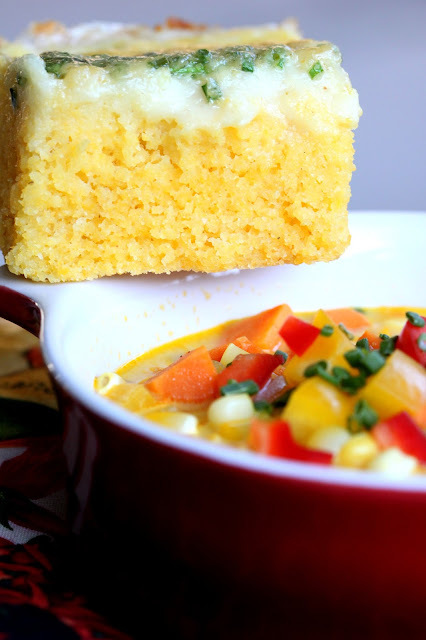 You are so right that you can't serve soup without cornbread. :) My husband won't let me serve soup without it. That's a good looking cornbread!